The New Apple Ads: Are Geniuses There to Guide or to Babysit? The new Apple Genius ads. The sentiment from folks like Adam Lisagor on Twitter is that they’re not bad, but not great – and Apple ads should be great. 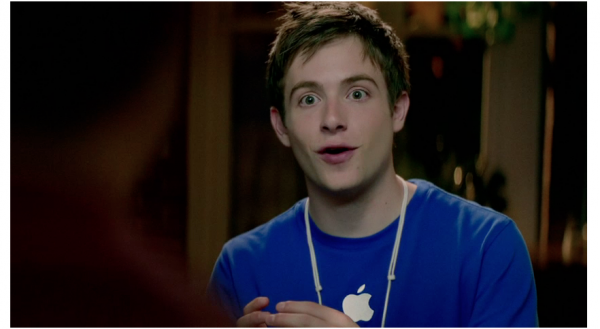 If I get the gist of the three latest TV spots, Apple has Geniuses in place who simply love helping people. It’s not just a job for these people – it’s a lifestyle. So new users shouldn’t worry about their switch to a Mac, because Apple will help them prepare home movies on an airplane, tell them about how iPhoto can create photo printouts of their new baby (whose birth they’re essentially ignoring), and tell them that you… basically haven’t actually purchased a Mac? Okay, I’m not so sure about that last one. I say them, of course, because sites like Daring Fireball have also been pointing out that these ads are not for the more passionate Apple fans – heck, they’re not even for current owners of Macs. They’re for switchers; folks who haven’t experienced Apple Magic (so to speak). I think the ads are funny, and I don’t really take them too seriously, but they don’t seem to be sending the best message about Macs, or even Geniuses. Making sure people feel like they’re being taken care of is an Apple strength, but it isn’t the Apple strength – not by a long shot. What about hardware quality and design, tightly integrated software, in-store hardware and software support, and a gigantic and thriving App Store? The magical elements introduced in iPad and iPhone ads that help you do more than you ever thought was possible on a mobile device, or even Apple’s “it just works” reputation, are absent. Instead, Geniuses are just made out to be very competent Geek Squad members dressed up in blue. I wouldn’t go so far as to say these ads will damage Apple’s reputation, but I don’t think they’re doing the company any favours. Obviously you have never done technical support (professionally) before. The “lets worry about your child being born” is a stretch, but “distracted” would be the nicest way ever to describe the average user. Don’t get me wrong I love what I do and I love supporting technology… but as a tech blogger – you’ve got a MUCH higher computer literacy level than most. I’m actually very used to talking to people who like tech a lot less than I do – and I know some friends who will simply ask me to do things for them instead of bothering to learn. But I think that this just subtly reinforces the fact that tech is just too hard to learn. I think there’s a way to help people along, even do things for them, while empowering them along the way. So you’re right: there are definitely people like the ones in these ads, but I don’t have a good gut reaction to the approach. As a person that is currently interviewing for a position with Apple, let me say that the majority of the questions have been aimed at customer empathy. I believe that Apple has the right idea in concentrating on the consumer, with the intent of assisting the technically proficient or coddling the technophobe. That way, they get the business of both. Some people of greater age are intimidated by things that their kids find simple. So the “Just Works” applies as well as a support team that will start at the level the customer needs. Tech with training wheels if you will. My 2 cents (I refuse to acknowledge inflation in this instance).